3D printers are changing the way that artists, designers, and engineers create and prototype their designs. Instead of having to pay a significant amount of money to have your CAD designs and project boxes molded and manufactured at a company, you can print high quality plastics right from your desk. In JBHT 237 we have 3D printers. These are both capable of using a number of materials for printing. As well as making high quality prints quick and efficiently. This tutorial is for the TAS 6 (to the left of the work station) and TAS6 mini (to the right of the work station). Unlike traditional (2D) printers, these take a little more effort and configuration to get them working properly. However, this guide will hopefully answer any questions you have and help you get started. As you probably know, 3D printers use melted plastic through an extruder head to create plastic objects. Common printing plastics have melting points upwards of 190C (374F). Plastics like TGlase melt at around 240C (464F). For a comparison, the average temperature which burns skin is around 80C (176F). Luckily, only a couple of the parts on the printer get this hot. The print head, often referred to as the “hot-end” is the most obvious hot part and special care should be taken to avoid touching it in general. Another part, which is often overlooked is the print surface/base plate. It heats up around 60-100C (140-212F). This is to ensure the plastic does not cool too quickly and become warped or brittle. It cools down much slower than the print head, and caution should be taken to avoid burning yourself on it. Luckily, the TAS6 will retract the base plate until the surface is safe to touch where it will then return the base to the forward position so you may retrieve your model. (there are plenty of tutorials online for obtaining these modeling files). Make sure the USB is plugged into the host machine. Since these printers are managed by the tech office in JBHT 440. These should be plugged in already and moved. Power on the TAS6. There is only one switch in the front. Import your model using File->Open File(s)..
Now that your drawing is staged and ready to go. The printer needs to be warmed up and the material needs to be primed. Switch to the monitor tab in CURA and click the Connect button. 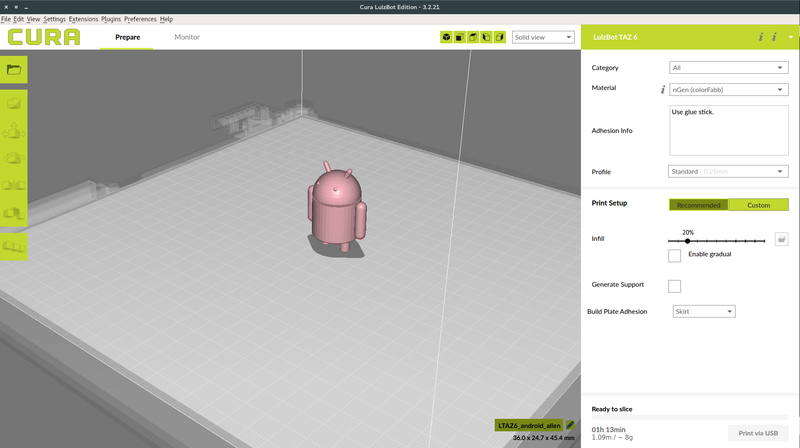 CURA will attempt to connect to the printer. If the printer is unable to connect. Make sure the usb is snugly plugged in and the printer is powered on. Contact root@csce.uark.edu if it still won’t connect. Unless you, and the person who printed before you are wanting to use the same filament material and color, you are going to need to change the filament. This is relatively easy but special care needs to be taken that you follow all steps. Make sure the surface is clear and the print head is high enough to have safe clearance for wiping the head. You can manually adjust the print head position using Z+ axis in CURA. Find the label on the side of the reel of old filament. There should be a temperature range. The best thing to do is to split the difference between the two numbers. (For example, Verbatim 3mm PLA has a 200-220C suggested temperature, so the hot-end temp should be set to 210). These temperatures can be found on the spool of filament you wish to use. 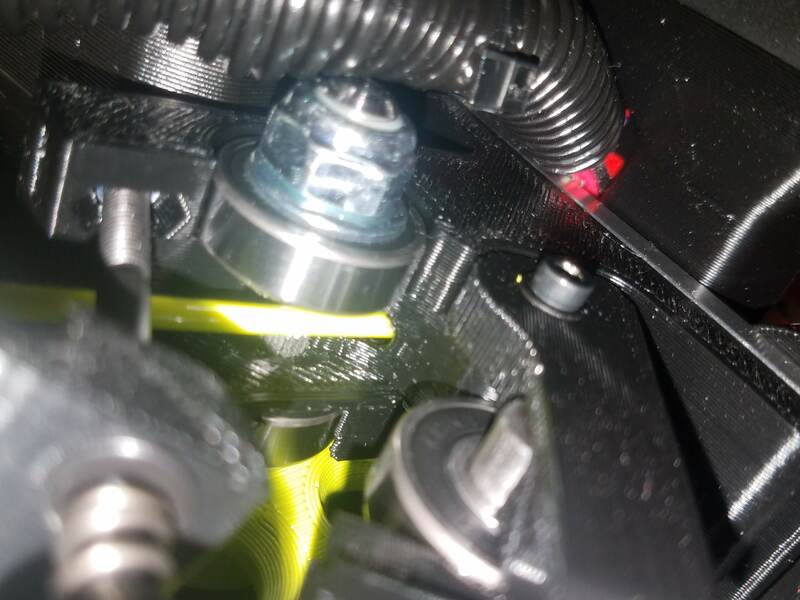 Once the hot end has reached the target temperature, unscrew both of the locking screws around the feeder and move the locking arm to the left away from the filament. None of the parts in this section should be able to burn you. Keep in mind the locking screws should only be undone enough to allow filament to enter. If the plastic piece the locking screws threads through comes out, you went too far. Pull filament out slowly, you can pull relatively hard but it shouldn’t take more than a snug, slow, pull straight out. The end of the filament can be a little hot if it has not fully hardened yet so be careful. Filament A was used for the last print. It has a range of 200-220C. Filament B is the new filament and has a range of 170-190C. It is usually safe to set the temperature from 195-200C for removal of the previous filament. 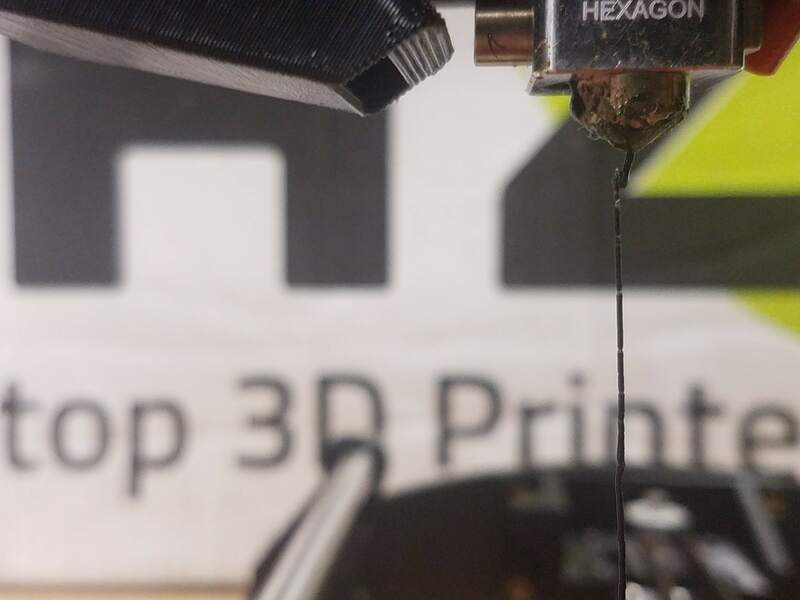 After the printer has reached the common melting temperature, take the new filament and feed it through the guiding tube and into the feed hole. It should go a few inches down before you feel heavy resistance. It is often helpful to wiggle the filament as it goes down as it will prevent it from getting stuck. While pushing firmly on the filament you should see the old filament start to come out. There is more in there than you think, so continue pressing until the color changes almost, if not entirely, to the new color. Once the color has changed over, close the locking mechanism back and set the temperature to the normal melting temp for the new filament. Make sure the filament is loaded and lock screws are tightened properly. Go ahead and check the “Changing Filament” section above if they are not. Make sure if your object has any sort of overhang that you “enable structuring”. This can be done by going to the print options under infill and checking the option next to “generate support”. This should be checked by default, but it is always good to check. It will look like picture 4 below. Click the start print button. The printer head should move and the plate and hot end should begin to heat up. The printer will run a cleaning cycle which involves running the print head over the surface on the left side of the pad. If you selected skirt mode in CURA (this is recommended for most basic prints) you will see the printer draw an outline wider than the normal base of the print. This is to make sure filament is coming out before beginning the print. The printer will take a while, so feel free to work on other projects or get some food. Below are some progress pictures of a print. Use a flat knife (there should be one near the print station) to gently remove the print from the build plate. Congratulations! You have finished printing, cutaway the support structures and enjoy!